Brad Mathias thought everything in his family was fine. A busy, contented dad he had noticed that his children weren't as close as they used to be--and his daughter Bethany, in particular, had become withdrawn and moody. But he assumed she was "just being a teen"...until he and his wife learned the secret Bethany had been carrying, one that rocked their family to the core. In a last-ditch attempt to reach their daughter and to reconnect as a family, Brad and his wife piled everyone into the car and embarked on a wild, crazy, seven-thousand-mile trip across the country. As they drove, they realized how far apart they'd drifted, found unexpected blessings along the way--and journeyed together from pain and loss to recovery and healing. In Road Trip to Redemption, Brad tells stories from the road about God's grace, shares principles he learned during the experience, invites you to consider your own epic journey as a mother or father, and calls you to trust wholeheartedly in the amazing love God has for your kids. I'll come clean...what drew me to this book was not he spiritual component or the parenting component. What made me want to read this book is that I love road trips. I grew up taking road 4000+ mile road trips every summer and I know that we'll be taking our kids on such trips as they grow older. So, really, this book was right up my alley. The thing is, yes, there is a road trip in this book...but it isn't what the book is about. Instead, this is a Christian parenting book. Mathias starts by giving us a brief history of his marriage and family, bringing us to the "start" of the story and the calling for him to take his family on this road trip. While Mathias talks a bit about traveling with teenagers, he spends more time talking about the spiritual discoveries of his family. I found this incredibly interesting, but I will say that this is not really a book for someone new to Christianity. Mathias had matured in his faith in the years leading up to this road trip, his children were maturing in their faith during the road trip and I think a somewhat mature faith is needed to appreciate what he has written. I also felt that this was more of a "fathering" book than a "parenting" book--there is nothing wrong with that. Mathias is a father so it is only natural that he would write from that viewpoint. However, as a mother, I found this book more as something I would recommend to my husband than one that I would read for parenting advice for myself. 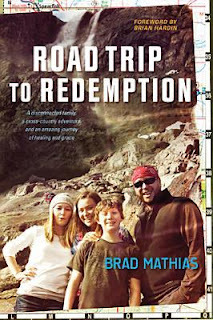 So, not counting that sentence, Road Trip to Redemption turned out to be less a road-trip book, but more an enlightening story of a family's--and a father's--spiritual growth. Tyndale House Publishers provided me a copy of this book to read in return for an honest review. I received no other compensation for this post. This Lutheran lady agrees. And odd list, for cure. I went on a lot of road trips growing up too. I think back on them quite fondly. I would love for my daughter to have some similar experiences in that regard. I find it amusing more than anything that he'd include Lutheranism in that list. Other than than, this sounds like an interesting book. I wonder if my father-in-law would enjoy it as it sounds like his type of book. And I'm curious to know if he'd pick up on the Lutheranism part given he's Lutheran.